Patient’s bodies are interconnected systems. Organs are made of tissues, which are made of cells, which are made of molecules. What’s Doctor Know? It’s a fun way to help teachers, students, and the general public understand how biomedical innovations are transforming medicine. Players assume the role of a physician who must diagnose and treat patients using a toolkit of tests and treatments. At the start of the game, that toolkit contains familiar, established techniques. Over the course of the game, players can adopt innovative new biomedical tools to diagnose their patients more accurately and treat their ailments more effectively. During the game, players must keep in mind that their patients' bodies are interconnected systems, and that treating one part of the body may affect other parts of the body. Players need to carefully consider the pros and cons of each treatment to see which is the best solution for their patients. 1. Our bodies are made of smaller components, including cells, and cells have even smaller biochemical components. 2. Our body systems are interconnected and always at levels that span systems at the level of molecules, cells, tissues, organs, and the whole body. 3. People can now engineer diagnostic and therapeutic solutions at the molecular and cellular levels to create precision medicines that target disease cells. These solutions can minimize related side effects, including harm to healthy cells. 4. 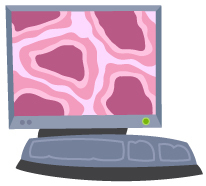 Because of the massive amounts of data generated by modern diagnostic techniques, people need to use computers to organize and search for patterns of disease. Grade 5, Concept 2, PO 1. Provide examples that support the premise that science is an ongoing process that changes in response to new information and discoveries (e.g., space exploration, medical advances). Grade 5, Concept 2, PO 3. Describe how scientific knowledge is subject to modification and/or change as new information/technology challenges prevailing theories. Grade 6: Concept 1, PO 5. 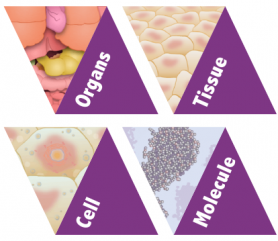 Explain the hierarchy of cells, tissues, organs, and systems. Grade 6, Concept 2, PO 2. Describe how scientific knowledge is subject to change as new information and/or technology challenges prevailing theories. CCSS.ELA-LITERACY.RI.6.10By the end of the year, read and comprehend literary nonfiction in the grades 6-8 text complexity band proficiently, with scaffolding as needed at the high end of the range. 3-5-ETS1- Generate and compare multiple possible solutions to a problem based on how well each is likely to meet the criteria and constraints of the problem.